Yes.. Yes.. A-listers and Hollywood darlings have been spotted here.. blah.. blah.. blah.. That’s not why I have wanted to go there… honest! It’s actually because this is really quite a unique development in terms of architecture and interior design. Why? Because it is THE joint venture project between Harry Handelsman of London’s uber cool Manhattan Loft Corporation and the Superstar Hotelier Andre Balazs who is responsible for some of the most luxuriously happening, uber uber cool boutique hotels in the US. For those who do not know, I meant Chateau Marmont in LA, the Mercer Hotel in New York and the Standard Hotels in LA, Miami, New York etc. The Chiltern Firehouse being Andre Balazs’s first property outside the USA, one can only expect great things from this collaboration. 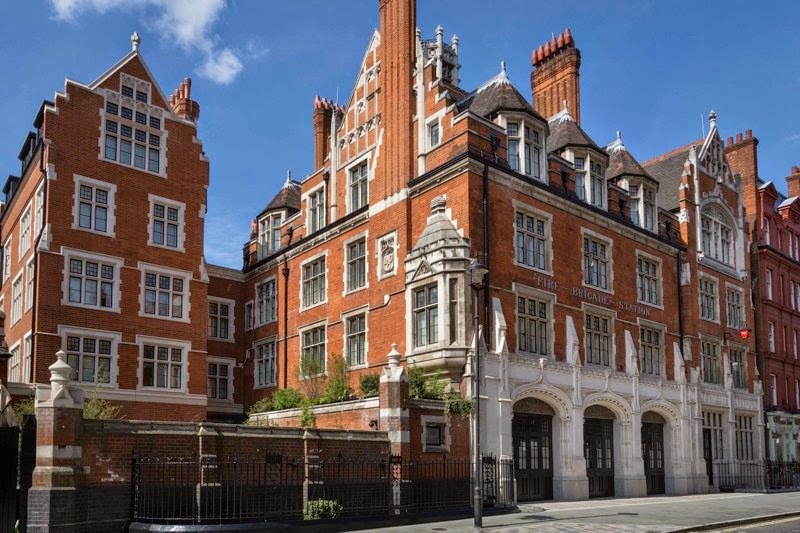 With London’s master restorer of high profile listed buildings, Harry Handelsman of Manhattan Loft Corporation, heading the property development team, the 1889 former Fire Station surely is set to transform into the new architectural and interior design gem of London. After all, the restoration of the derelict Grade I Listed St. Pancras Old Midlands Hotel into the St. Pancras Renaissance Hotel was so beautifully executed with such sensitivity to its English Gothic heritage that not only did MLC managed to restore Sir George Gilbert Scott’s masterpiece to its former glory after more than 76 years of abandonment and disrepair, they had also managed to integrate all things hi-tech that a modern hotel needed to operate efficiently so seamlessly into the fabric of the building that one would not notice them at all… An extremely difficult task to achieve given the existing site was an English Gothic masterpiece that was built centuries ago, when none of these technology nor modern infrastructure existed, and obviously was not designed nor built to accommodate any of them! There was not a single detail out of place at the restored St. Pancras Renaissance Hotel, which was what distinguished a master developer from an ordinary one. So obviously when this almost-5-year restoration project had finally opened its door on 14th February 2014, I wouldn’t miss it for the world! What else to be excited about? Oh yes, one of my favourite chefs, Nuno Mendes of Bethnal Green’s Viajante is also heading the kitchen and responsible for the menu at the Chiltern Firehouse Restaurant… so, another plus point, no more traveling all the way to East London for Mendes’ food, yeay! With so many aspects of the experience to write about, I had divided my coverage into 2 articles, otherwise it would definitely be too long. 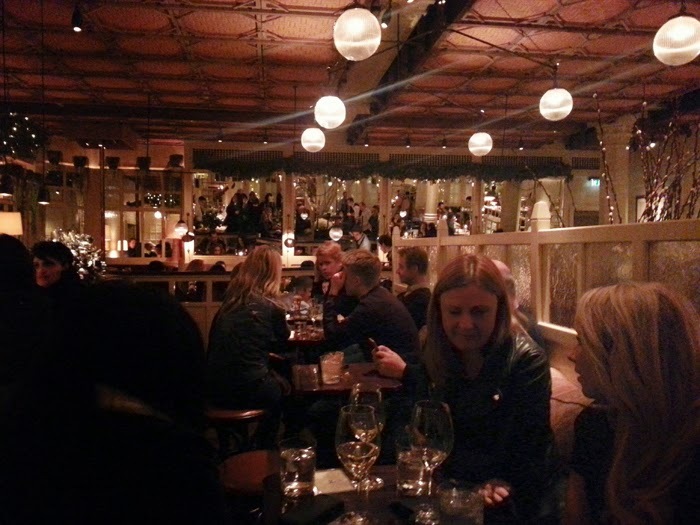 Anyway, food and celebrity hype aside, let’s concentrate on the design aspect of Chiltern Firehouse first! When we arrived, we almost couldn’t find the entrance… Actually, almost walked pass the building altogether if it weren’t for a handful of paparazzi standing around with their huge camera lenses outside a rather large but understated wooden gate. So, exterior wise, beautifully restored as expected. There was nothing “new-looking” that were out of place at all… The new part of the facade that was really visible was the reinstatement of the original arches detail and the fire station doors below the original “fire brigade station” signage… and when I said really visible, I meant one could tell that it was new because the stone arches were made of new stone so there was obviously colour difference to the weathered old stone of the original facade, even though the stone used was a match. The rest of the exterior just looked like they had been thoroughly cleaned. 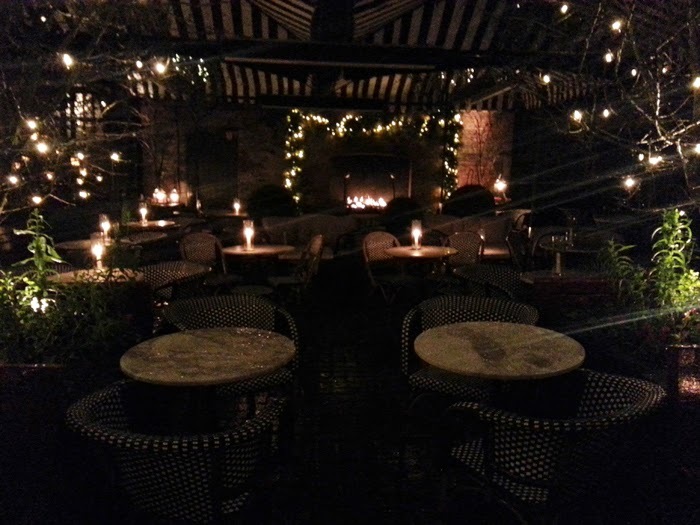 Once we walked through the gate, we were faced with a rather enchanting courtyard bar area with a cosy fireplace set inside a brick wall at the far end of the space. The hedgerow was decorated with fairy lights and pretty little lanterns scattered all around the enclosure. I really wanted to sit in this area later in the evening when the fairy lights and lanterns were lit, but first thing first… definitely have to check out the restaurant. 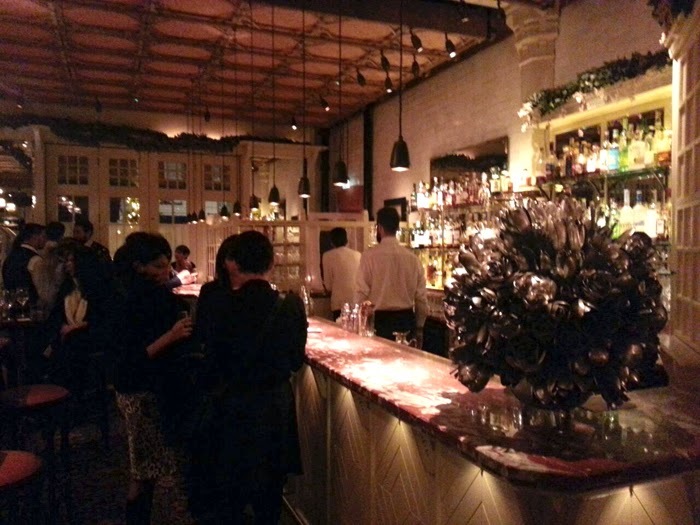 The main dining area of the restaurant and the bar, though, were fantastic. The interior decor was, of course, done by the Parisian designers Studio KO … Again, it was sensitive to the architectural heritage of the building, timeless, elegant yet simple, with a vintage feel and tres tres chic. I loved how the original steel structures, both beams and columns, supporting the garage were incorporated so beautifully into the new interior design scheme. The ceiling panels were really quite unique, it was a creative adaptation of an acoustic panel (or a homemade acoustic panel) consisted of worn-down looking upholstered squares of cushion-like infill panels encased within rustic wooden frames… The ceiling looked old even though it was not an original, but it had a crafty vintage feel that belonged, as if it had been there for centuries. Of course, the functional part of these soft ceiling panels was acoustic control, so that the echos from all the conversations in this vast open space were absorbed and minimised to the fullest… The acoustic performance was quite impressive, I had to admit. The vintage glass pendant lights and various combinations of vintage french brasserie seatings combined with mix and match upholstery, combined to create a glamorous yet relaxing, friendly atmosphere. I could easily see why there was so much hype surrounding the restaurant. Opposite the front desk was a large horseshoe bar area for pre-dinner drinks, while further to the back was a large open kitchen on elevated floor with bar seatings around the food preparation area, which was the showcase of the restaurant. 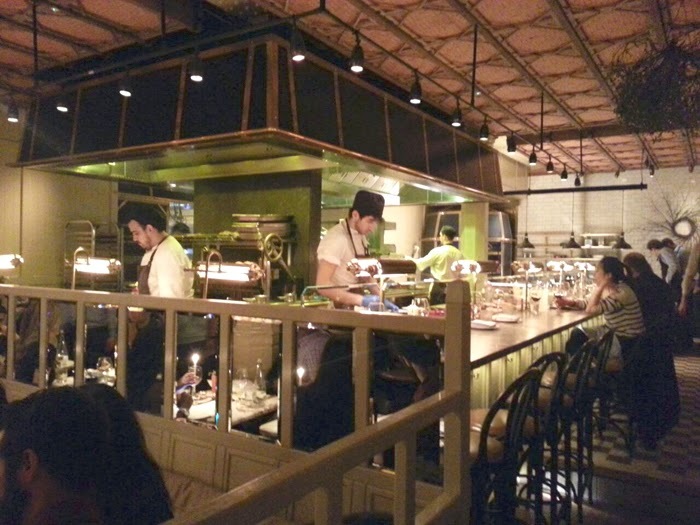 We were quite lucky that we were seated close to the open kitchen so we got to enjoy watching the chefs busy preparing the food, while we waited for our orders, not to mention, easy for celebrities spotting too because our table was on the elevated part of the restaurant. In terms of design, I thought that Chiltern Firehouse was very well executed and even more sophisticated in its conception. Every detail and social interactions were planned for, resulting in a highly glamorous setting with friendly, buzzy atmosphere, yet very down-to-earth. The whole experience was so smooth and natural that one really had to look hard to notice how well each detail was executed… and by this, I did not mean just the architecture and the interior decor… I meant the level of care and attention in picking their chatty, friendly, glamorous yet personable waiting staffs, the design of the uniforms, the charming Maitre D etc. etc. Even though the crowds were intimidatingly high profile…. It was like the whole of LA’s Chateau Marmont had migrated to London or something like that! Almost everyone there seemed to be in the entertainment industry… both on screen and behind the scenes… It was very clear that this was and most likely would be from now on… the networking place of Hollywood elites… Having said that an ordinary soul like me did not feel too uncomfortable or out of place being there because the staffs were so attentive and charming, that they made us felt relaxed to be there… Of course, the vintage decor helped one feel more at ease with the surrounding too. Now, see what I mean when I said that every detail here was so carefully planned out by the real maestro of the luxury hospitality business?